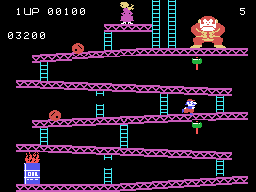 Donkey Kong is a port of the Arcade platformer and it was bundled with the Colecovision console. You can choose to play with 1-2 players and there are four different skill levels available which affect the speed of the enemies and obstacles. Similar to most other home ports it only features three of the four screens from the Arcades meaning the Conveyor Belt level is entirely absent. As soon as you start the game you'll immediately notice that the Barrel Stage layout has been altered as Donkey Kong stands to the right of the screen instead of the left. There are only five platforms instead of six and this is possibly due to the aspect ratio change from a vertical cabinet to a game on a 4:3 consumer TV. It's also missing a few enemies and when you finally defeat Donkey Kong in the Rivet Stage the game quickly moves to another stage instead of showing you the cut-scene of him falling off the platform and Mario being reunited with Pauline. However, at the time this version came out it must have blown people away as they could actually have an arcade experience in the home that was pretty close to accurate. Each stage plays really well and the same risk-reward element is still present that will keep you playing until you beat your high score. Bonus items are scattered around each stage and although they're optional it's worth picking them up as they count towards your score. Mario controls decently given the limitations of the Colecovision analog stick but using a Mega Drive controller solves any issues you might have. The graphics look great with lots of colours on display and the music / SFX are very authentic to the original. Donkey Kong for the Colecovision isn't the best port but it would be unfair to be too harsh when you consider the timeframe it was released. It plays decently and although it was surpassed by future ports (namely on the NES and Amstrad CPC) it's still head and shoulders above other home versions of the early 1980s. Random trivia: It's rumoured that Coleco purposely made the Atari 2600 and Intellivision versions of Donkey Kong look and play poorly to make their own console port seem superior. As a result they sold six million DK cartridges on the Colecovision which grossed over $153 million!